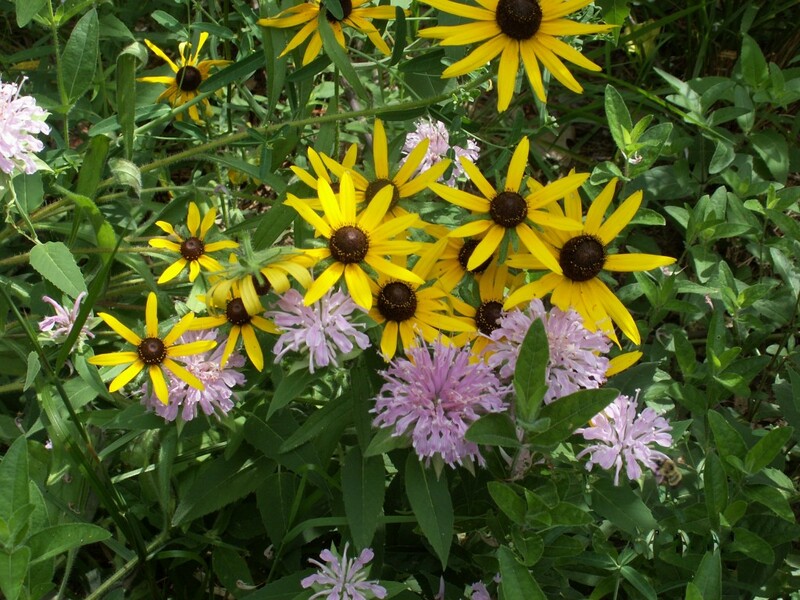 Gardeners can plan ahead for summer at the UU plant sale: Bee Balm and Black-eyed Susan mid July. Rain or shine on May 9, by 10 a.m. gardeners from the First Unitarian Universalist Society of Middleboro, 25 South Main Street, will again have the lawn covered with flats of a huge variety of annuals, herbs and vegetables all grown here in southeastern Massachusetts, perfect for everyone’s summer garden and patio pots. There will also be beautiful hanging plants in peak condition to brighten porches or warm the hearts of moms and grandmothers for Mother’s Day. In spite of the slow beginnings to this spring UU gardeners have been able to dig and divide hundreds of perennials. Among the plants shoppers will find selections of iris, phlox, daylilies, bee balm, and numerous members of the daisy family that guarantee long seasons of vibrant gardens for many years to come. Shoppers will also find mixes of woodland wildflowers to bring the joy of discovery to every spring, native New England flowers of many species to delight New England’s native bees and butterflies, and ground covers for almost any condition. And last but not least, this year there is an especially large selection of perennial herbs and even a few blooming shrubs. Gardeners on duty at the sale have promised to tell customers everything they know, including any cautionary tales, about the plants they sell. So they urge you to come with a notebook as well as cash. The gardeners also recommend that you come early for the best selection as quantities are limited. There may be a second chance at what is left on Sunday afternoon, but that is not guaranteed.